The Stromberg Invincible Orchestra Drum hardware, which was previously painted silver in a misguided attempt at 'restoration' by a previous owner, has been cleaned and polished. The paint came off fairly easily with lacquer thinner and a toothbrush revealing the original nickel plating underneath which is in fairly good condition all things considered. The plating on the lugs and claws, both of which are made of brass or bronze, is in much better shape than the plating on the steel tension rods which is to be expected. 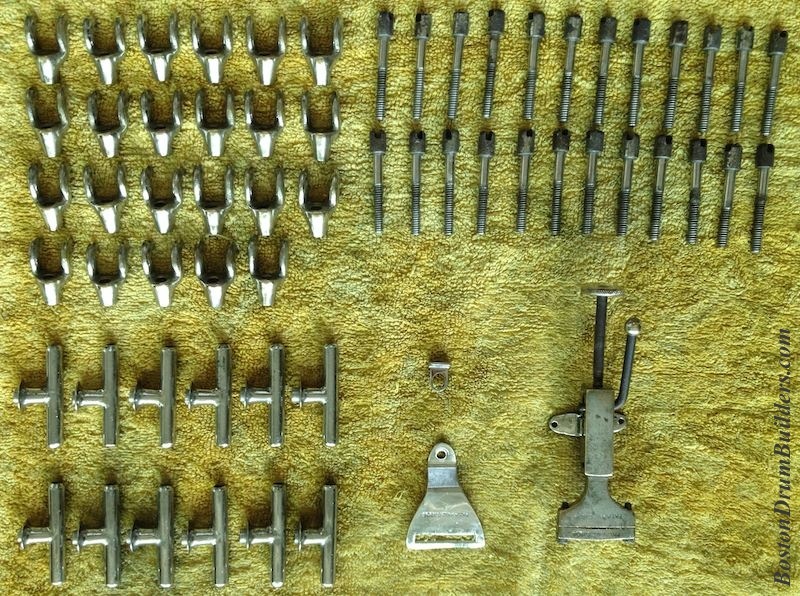 The remaining plating on all of the hardware shined up well using Cape Cod Polishing Cloths. Now the hardware waits while I search for the correct color of shellac for the shell and hoops.